Contemporary and bohemian-style wedding cake designer blogs about wedding inspiration and helpful advice when it comes to planning your wedding cake. 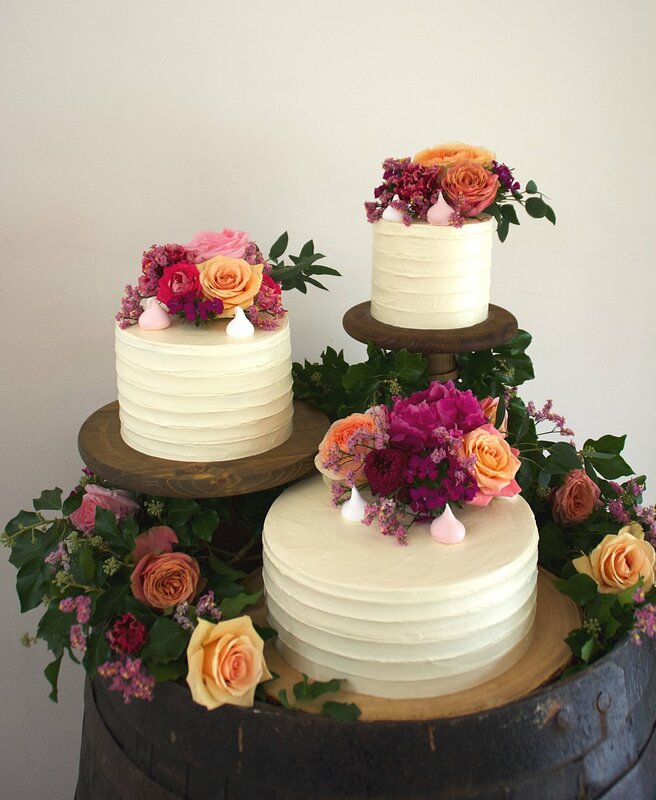 Rustic wedding cakes: naked, semi-naked, dirty-iced. Help! What’s the difference? What the hell am I asking for? Is it a naked cake, semi-naked, dirty iced? Hell, it could be bikini-clad for all I know! Whatever happened to just ordering a cake, plain and simple, without all this talk of its state of undress, which frankly gets me hot under the collar? Let’s get down to basics; a naked cake is a cake in its birthday suit, not even a jot of underwear to cover its modesty. It’s essentially layers of sponge filled with jam and buttercream and either stacked into a tiered cake or served as separate tiers. Decorated with fresh fruits and flowers, these cakes look beautifully rustic and are great for those who aren’t fans of fondant or too much buttercream and want something simple and understated for their wedding day. Don’t be deceived however, they may look easy but they are tricky to get right, as there’s nowhere to hide. Those layers need to look spot on perfect with just the right amount of buttercream oozing temptingly between them. As they are prone to drying out quickly, without the moisture-locking magic of buttercream or fondant, they must also be made as close to the wedding day as possible. Here we give the cake a smattering, a light negligée if you will, of buttercream. A semi-naked, or ‘dirty iced’, cake has a thin covering of buttercream, which has been scraped to reveal a peek of the sponge showing through. These look beautiful adorned with fresh flowers and that buttercream helps to seal in the sponge, making for a moister (don’t you just love that word!) cake. If you opt for different flavours for each tier, and therefore possibly different colour sponges, then this can add to the design. 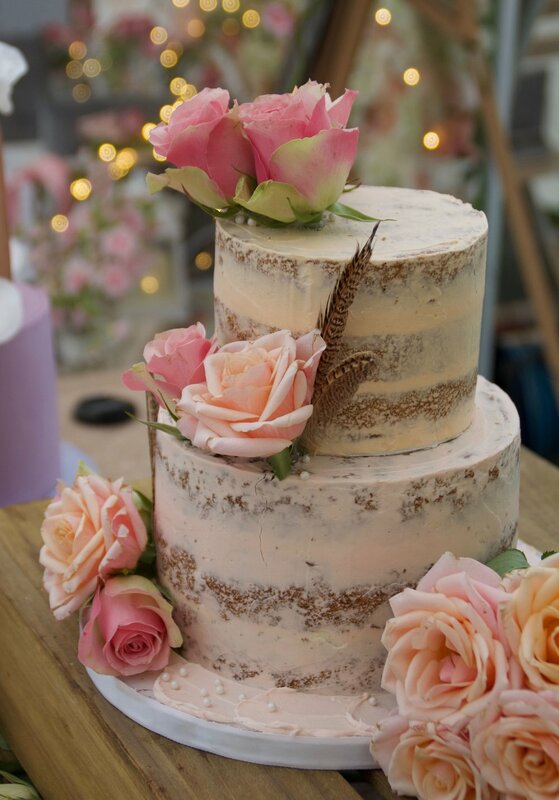 Or how about using coloured buttercream to tie in with your wedding styling like this peach and blush beauty? Again, don’t be fooled that this is an easy, just slap it together, cake to make. Getting those sharp edges can be tricky and buttercream is a messier medium to use than fondant, which reminds me, buttercream cakes don’t react well to boiling hot marquees. I have some tricks up my sleeve to mitigate the effects of a heatwave but your cake can only bear so much heat in the midst of summer! Cloaked in a thick velvety layer of buttercream, fully iced cakes can be as smooth as a baby’s derrière or ridged and textured to create interest and serve as a canvas for that all important rustic look. It doesn’t always have to be white either, opt for a different colour buttercream to make your cake pop and you can go dark with it too. Warm greys and navy blues coupled with splashes of vibrant colour can be so eye-catching. If boho isn’t your style, then modern, art-inspired designs using buttercream with a palette knife, as if it were an oil painting, are very on trend right now and with a splash of metallic splatter or gold leaf, your cake could be a real showstopper. Don’t be afraid to be different and let your cake be an expression of you as a couple. If you want to chat cake, then hit me up at enquiries@cherrytreecakerie.co.uk or don’t be shy, give me a call on 07518 800529.